Razer is the world leader in high-performance gaming software, hardware and systems. The company’s Razer Ouroboros Elite is a superb wireless gaming mouse which lefties can also use. It’s loaded with immensely useful features. 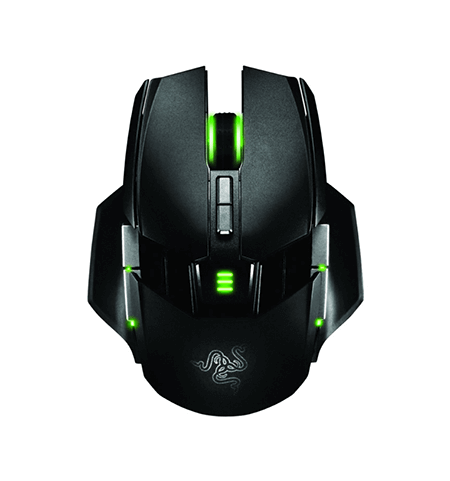 This Razer Ouroboros Elite Ambidextrous gaming mouse weighs 6.4 ounces and measures 2.8 x 1.7 x 1.5 inches. The great build quality of this gaming mouse is impressive. It stands out with its attractive appearance. The bright green light on the scroll wheel, side accents, and battery indicator add to its good looks. This gaming mouse has enough buttons to please many pro gamers worldwide. In fact, it has 11 programmable buttons all of which are easily accessible. You can adjust the length of this mouse. It has a back tilt and four interchangeable side panels. Its comfortable shape suits all types of hand shapes and sizes. It is well-known for its high level of customization. Its ambidextrous ergonomic design helps you to play without getting tired. The mouse has a dedicated trigger button for DPI clutch functions. This feature provides you an edge over your competitors. It helps you to adapt to various situations. To use this button, you just need to hold it down. You will be able to temporarily increase or decrease the DPI, thereby enabling you to obtain the exact sensitivity you need for the moment while playing the game. This gaming mouse performs quite well even in non-traditional surfaces like cloth, wood, vinyl, plastic and more. One of the reasons for this gaming mouse’s outstanding performance is its 8200 DPI 4G laser sensor. It is the most advanced and configurable sensor yet. It helps you track precisely and to hit targets where you need to. It can be calibrated to your surface. The Razer Ouroboros Elite Ambidextrous comes with gaming grade wireless technology. The mouse’s software suite is top class. The mouse comes with a 32 bit ARM processor. The Razer Synapse enables you to customize details like sensitivity, lift-off tracking, surface calibration, and to save the same in the cloud. This hardware configurator makes it possible for you to enjoy your game wherever you are. It keeps your gaming mouse in peak performance via automatic driver and firmware updates. This helps you to always be on top of your game. The mouse runs on a single AA battery, with which you can enjoy up to 12 hours of gaming. The NiMH battery is rechargeable. When it is depleted, you can plug in the USB cord or place it on the dock to recharge. It is easy to clean this mouse; it has a textured plastic finish. Some users are not happy with this mouse due to its light weight, but otherwise, it is a very good mouse. With this gaming mouse, Razer has lived by its motto “For Gamers. By Gamers.” The Razer Ouroboros gaming mouse is an incredible gaming mouse, which helps you to take your gaming to an entirely different level. This mouse definitely outperforms many cordless and corded gaming mice. You cannot say that it is a cheap gaming mouse, but it is definitely worth its price.